Another key benefit in using Zoom on your WordPress site is that it can be hosted and indexed within an intranet. Other search services like Google Syndicated Search are remotely hosted, and require your website to be publicly accessible over the Internet. Searches will also need to occur with full Internet access, and you will have no control as to how often the index is updated or what pages should be included or excluded from the indexing. With Zoom, you can run and schedule the indexing yourself on any Windows computer on the network. The following article explains how to use Zoom with your WordPress website. 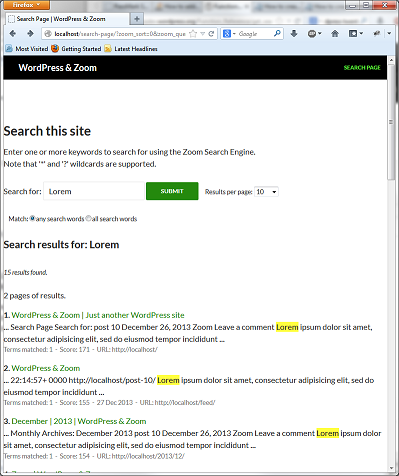 We provide this tutorial to explain some common details and steps to get a working Zoom Search Engine up and running, and integrated with your WordPress web site as quickly as possible. Zoom is free for small websites of up to 50 pages. For larger sites, commercial editions are available, with the Professional Edition being the most popular, which indexes up to 200,000 pages and costs only US$99. Detailed comparison of the different editions available can be found here. Using Zoom on a WordPress website is much the same as using it on any other website, so you will find much more detailed information on installing and running Zoom in the Users Guide (free PDF download). We recommend referring to the Users Guide for most instructions and taking note of the following tips for guidance/reference for WordPress specific details. For a WordPress website, you should use "Spider Mode" in Zoom, which allows it to crawl your live WordPress website. You should specify the URL to your website (eg. "http://www.mysite.com/") as your Start Spider URL. One important thing to be aware of when indexing a WordPress site, is that dynamically generated sites, especially complex CMS systems like WordPress (and other forum software, photo galleries, etc.) are generally not particularly Search Engine Friendly. Some of these issues are discussed here, which cover general issues with indexing message boards, etc. As you will notice, the default search page is fairly blank, as it has not yet been customized to suit the look and feel of your website. In addition to this, we would want to integrate the search page within your WordPress site, and we will explain this below. At this point, you should have a working search page which you can access and perform search queries on as seen above. The simplest option is to add an item in your menu which links to your new search page. You can use your search page just as it is, and simply modify the "search_template.html" file to match the look of your site. 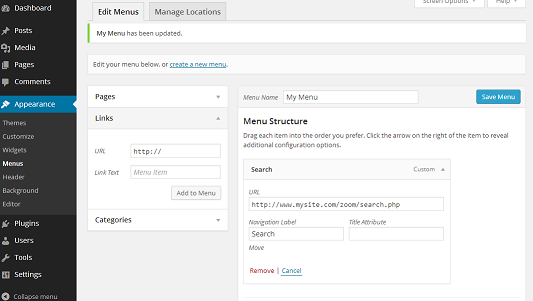 For example, from the "WordPress" administration page, select "Apperance->Menus". Edit your existing menu (or create a new one) and click on "Links". You can specify a name for the link (eg. "Search") and the location for the "URL" box. Here you should specify the URL to the working search page that you setup earlier (eg. "http://www.mysite.com/zoom/search.php"). However, if you want to further integrate the search page inside your WordPress website (so that it will maintain the same skinning and various modules you are using), then read on. Another option is to create a custom "Page Template" in WordPress that will include the search.php file from Zoom. (Note: Visit WordPress' site for more information and proper syntax & structure for creating Custom Page Templates.) Before we get started, there are some additional steps that needs to be done beforehand. We will need to make changes in WordPress and then in Zoom. The exact steps may vary depending on theme that is currently in use, but the general process is outlined below. The "Default" Permalink URL style (http://www.mysite.com/?p=123) in WordPress is not very search engine friendly, and as WordPress describes it themselves as "Ugly". While you may be able to get it working with Zoom using the default style (not discussed here, as a lot of additional work is involved), we recommend using one of the other Permalink options. From the WordPress Administration page, go to "Settings->Permalinks". We will choose to use the "Post name" style, i.e. http://www.mysite.com/sample-post/. A easy way for making a new Page template is to use with a copy of your page.php in the current active theme directory in WordPress. This way you start off with the HTML structure of your other pages, then you can edit as needed to include Zoom search. We will create a copy of page.php and call it mysearch.php. Edit the file and include the template name at the very top of the page. From WordPress Administration page, you will add a new page to your site. "Pages->Add New". Give the page a title, i.e. Search Page. Under "Page Attributes", select the Template dropdown box and locate the name of the new template file created in the previous step. Copy or take note of the permalink URL for this page. Click Publish to make the page live. You can go to your new search page and view the default search form, however the search implementation will not work just yet. We need to change a couple of settings in our Zoom configuration and reindex to apply those settings. In Zoom, under "Configure->Advance", enter the permalink URL for the search page into the "Link back URL:" box. 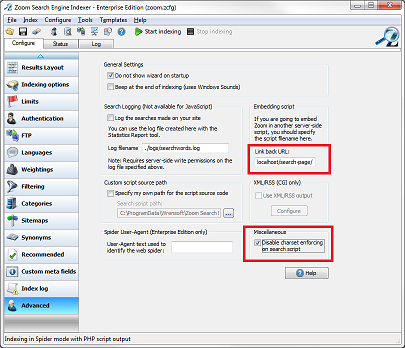 Additionally, enable the checkbox for "Disable charset enforcing on search script". Reindex and upload the files to your site. Your search should now be working. You will be able to customize the colours, fonts and overall look of the search page and search results by modifying the "search_template.html" page. Please see chapter 6 of the Users Guide ("How do I customize the look of my search page?") for more information. To do this, you will need to modify your theme header to include additional HTML code. You will need to replace the URL in the above HTML (in bold) with the actual URL to the new search page that you created earlier. Note again that you may want to modify your "search_template.html" file to make your search page match the look and feel of the rest of your WordPress site. Now you have your very own custom search engine as part of your WordPress web site! I hope the above has been helpful in getting you up and running. There are many options and configurations possible with Zoom which you can fine-tune to your heart's content, including highlighting, categories, and more. Please download a copy of the Users Guide for more information. Download and install Zoom now!